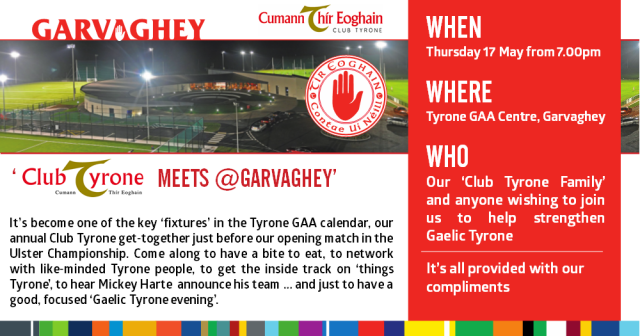 This has become an established, an important and above all an enjoyable part of the Tyrone GAA calendar and is when we celebrate Tyrone GAA and Club Tyrone’s part in it. This year we’ll be a wee bit different … so don’t miss it. 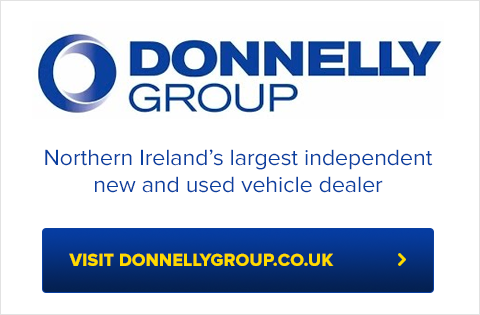 As always, we’ll begin with a bite to eat with our compliments and the chance to network with your Club Tyrone friends and colleagues. We’ll then brief you on progress and update you on some exciting things that are happening within Club Tyrone and Tyrone GAA at the minute. Mickey Harte will join us to announce the Tyrone team to play Monaghan in the Ulster Championship and there’ll be a free draw for everyone attending for two stand tickets for that game. As usual, we intend to have our evening’s business wrapped up shortly after 10.00pm. I hope you can be with us on 17 May to help sustain our Tyrone GAA momentum. In the meantime, thank you again for your unrelenting support for Tyrone, its Gaelic games and its people.